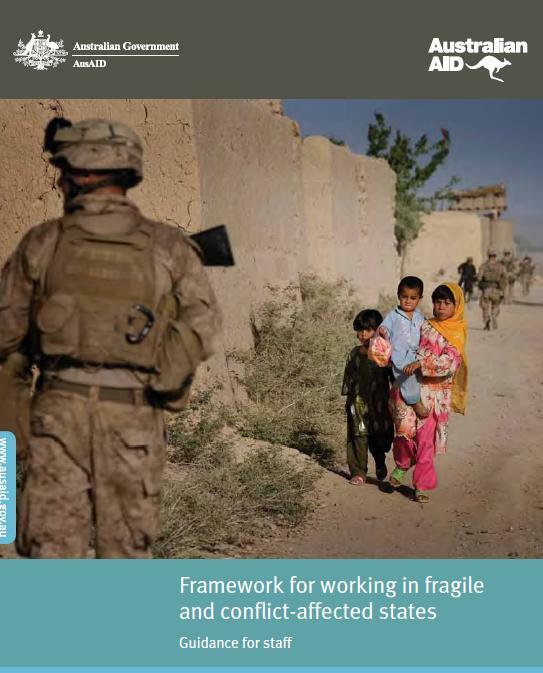 AusAID has recently posted on its website a paper of around 100 pages titled Framework for working in fragile and conflict-affected states: Guidance for staff. This is of interest not only within AusAID, but also to stakeholders who want to understand how the design and implementation of Australian aid are adapted to these countries’ situations. Many of the countries in the Asia-Pacific region to which Australia contributes aid are fragile or conflict‑affected. Others contain conflict‑affected regions, such as Mindanao in the Philippines. In recent years more than half by volume of Australia’s bilateral aid has been provided to fragile or conflict-affected countries, and this may well continue for some time. The paper draws on a growing literature about how best to provide international aid in situations of fragility or conflict. This includes principles formulated in 2007 by the Development Assistance Committee of the OECD and the World Bank’s study of conflict, security and development in World Development Report 2011. The paper also draws on AusAID’s experience, and that of other Australian agencies involved with it since East Timor in 1999, in “whole of government” interventions which combine development aid with security assistance. Readers will find in the paper an informative description of what characterises fragile and conflict‑affected countries, and of what should be done – or attempted – in Australian aid programs to accommodate or remedy these characteristics. avoid harm, notably through taking sides in internal conflicts or undermining local capacity. Understandably, there’s not much in this that’s new, even compared with AusAID‘s publications on the same issues under the previous government – only the thoroughness of the exposition, and some matters of emphasis and detail. Indeed, for many readers these operational principles may seem fairly obvious. But the paper tries to bring them to life through illustrations in text boxes describing recent Australian programs in particular countries. Presenting things in this way – a long exposition in general terms, with success-story boxes – has several implications. First, it underplays the conflicts of objectives – most evidently, between wishing to improve the functioning of government institutions in fragile states and wishing not to be associated with their corruption or their role in internal conflicts. And secondly, it makes the overall message resolutely positive, suggesting things can always be done to help in these situations – even while acknowledging that determining what to do is unusually difficult, there are more than the usual obstacles to aid effectiveness, and progress is likely to take a long time. AusAID’s wish to present a positive story is legitimate, but at some points the paper’s allusions to challenges are blandly optimistic – for example, in the section on pages 75‑6 about working with external partners, where it suggests that “AusAID can help governments build the capacity to coordinate others”, commends the brokering role of the UN system, and observes that when large multinational companies want to exploit natural resources, “governments need to ensure appropriate checks and balances are in place”. In that section, and more broadly, readers may find in the paper a different underlying message: that there are situations in which for reasons of security or foreign relations Australia must provide aid, even though making this aid effective is at best improbable and at times impossible. John Eyers is a former official of the Australian Treasury. John Eyers has worked in the Australian Treasury, ADB, Commonwealth Secretariat, Office of National Assessments, PNG Treasury, and the European Bank for Reconstruction and Development. AUSAid is to be commended for developing and releasing this paper. John Eyers is correct in his view that the Paper is overwhelmingly positive where experience may suggest otherwise. Perhaps we are able to learn as much from our failures in this complex and difficult activity as from our successes. I do note with interest that there is some emphasis through the Paper on the importance of building state structures and working through host Government systems. Both are critical in sustaining any intervention. Also of importance is integrating a focus on public finance management including revenue and expenditure management and procurement. Why procurement? Recent experience in fragile states suggests that public procurement can account for up to 60% to 70% of all government expenditure. In Swaziland, 65.9% of Government of Swaziland expenditure (both recurrent and project) was spent through a procurement process; in Timor-Leste, the percentage was 70.19%; and in Sierra Leone and Uganda, 70%. Procurement is a critical consideration in achieving the effective and efficient delivery of public services. It involves the management of a large amount of public funds and is the largest single cause behind allegations of corruption and government inefficiency. The combined effect of high value transactions, excessive discretionary powers afforded to public officials and dependency of private firms on government contracts to survive economically provide fertile grounds for procurement corruption in fragile states. Government contracts also provide an additional source of income for both politicians and bureaucrats and a substantial source of funding for political parties, election campaigns or individual politicians. Weak procurement policies and practices constrain fragile state development and waste scarce public funds. Efficient and effective procurement is an important contributing factor to the achievement of superior development effectiveness results for fragile states. As procurement is one of the most challenging sectors to reform because it often meets major resistance from vested interests within society, understanding the political economy aspects of procurement is critical to address the underlying factors that may impede the effective implementation of reforms. Procurement reform is a highly technical and complex process that requires major changes involving a wide variety of actors with multiple, often conflicting and changing political incentives that can complement or compete against each other. At the operational level, reforms involve major procedural changes that can profoundly alter the work of procurement officers and generate massive resistance from public officials who benefit from the old ways of doing business. Any improvement in the public procurement system can have a direct and beneficial effect on the overall economic situation of a fragile state. E. John Blunt is an Institutional and Public Procurement Expert with extensive experience in leading public procurement reforms in a variety of international development environments. He has worked in fragile states in the Pacific, Asia and Africa. He is currently on assignment with the Southern African Development Community Secretariat in Botswana.